In 1942, a man called Manfred Alexander turned up, unannounced, on my grandfather’s doorstep in Berlin. My grandfather knew him only slightly. He hadn’t seen him for several years. Like countless Jews, Manfred had been herded onto an eastbound train the year before, bound for God knows where. He’d ended up in a Concentration Camp in Minsk, run by the Ukrainian SS. There, after a terrible winter, a German guard whom he hardly knew hid him beneath the coal in the tender of a steam train which was carrying wounded German soldiers back to Berlin. Back in Berlin, cold and hungry, Manfred headed straight for my grandfather’s apartment on Grolmanstrasse. It was opposite the police station but it was the only address he knew. So he didn't end up in a gas chamber in Treblinka and he was transported beyond the River Bug. Of course, the article goes on to repeat the usual nonsense that "the land of Goethe and Beethoven murdered six million Jews, while most people stood aside and did nothing", but if this man was shipped on to a camp in Minsk, how many "countless" others were on his train and hundreds like it? He managed to find his way back to Berlin, then on to Switzerland, ending up in New York. Do other posters have similar evidence of mainstream media producing anecdotal evidence like this while parroting the orthodox line? I believe Eric Hunt's video 'The Last Days of the Big Lie ' details numerous examples of "survivors" having been sent east and then talking about it. These so called "survivor$" were recorded for Spielberg's 'The Last Days' which, in spite of the obvious contradictions, falsely claims that 6M Jews were murdered. "The mere fact that we have so many "survivors" when it's claimed that 'the Germans tried to kill every Jew they could get their hands on' blows away the scam. The massive numbers of so called "survivor$" are living testimony to the fraudulence of the impossible '6M Jews, 5M others, & gas chambers'." I know Eric's film, but my point is that this clear evidence for deportation to the East is on a mainstream mag site that then blithely ignores its own evidence and goes on to parrot the official line. I suspect there's a lot more like this out there that is open to quite a different interpretation to the one which is taken for granted. For example the stories about Ann Frank that make it clear no member of her group was gassed, most deaths were from disease and about half of them are known to have survived. There is evidence out there but journalists and readers alike are programmed by what they think they already know to ignore it or misinterpret it even as they write or read it. Good find. I'm convinced there is far more . There were hundreds, if not thousands of ghettos and camps erected in the East of Treblinka. For whom, if not for Jews from the West. You're well off on this; this guy was just one of the tens of thousands of Reich Jews deported to either Byelorussia, Latvia, Lithuania, or Poland, prior to BS&T even being built. Manfred Alexander , his mother [Judith; 49], and father [Max; 61], were deported from Berlin-Grunewald station on 14 Nov 1941 and arrived in Minsk on 18 Nov 1941 [see page 379]. In the town of Minsk, 2,600 Jews from Germany have been left over. Besides, all the 6,000 Jews and Jewesses are still alive who have been working, during the action, with the units who had employed them previously. Even in the future the largest Jewish labor force will be in Minsk, since the centralization of armament industries and the burden on the railways makes this necessary for the time being. 10,000 Jews is a lot people in one supposedly known location. So where is the necessary mass grave to review? Please show it to us. 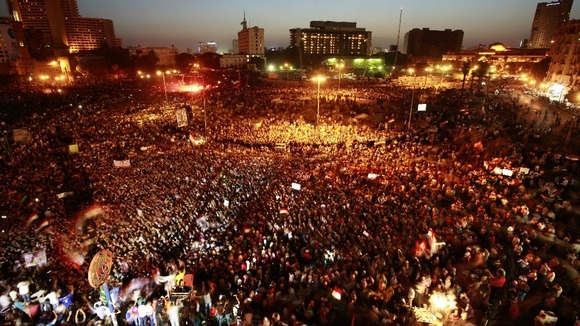 Here's a mere 8,000 people. The German "liquidiert" / "liquidierung" does not necessarily mean murder, as has been discussed aplenty at this forum. Dare to examine the absurd & laughable 'holocaust' storyline rationally, logically, scientifically and it falls apart like the house-of-cards that it is. There were a number of other extermination sites in the surroundings of Minsk. Beside the graves of Glinishchi in the north-west with about 66,000 and at Urechye with an estimated 12,500 (officially 30 000) destroyed prisoners of war there were the pit of Drosdy (10,000 dead civilians) and the graves of Petrashkevichi (14,000 to 20,000 dead civilians; officially 25,000 according to one source, 54,000 according to another) and at Tuchinka, at the Jewish cemetery, in the cultural park etc. Hannover wrote: The German "liquidiert" / "liquidierung" does not necessarily mean murder, as has been discussed aplenty at this forum. Considering Kube wrote that "... 6,000 Jews and Jewesses are still alive ... [... 6.000 russische Juden und Judinnen am Leben]", it follows that, in this context, "liquidiert" does indeed mean 'killed'; they weren't "still alive". A communist NKVD source for an alleged mass grave which we cannot / will not ever see? The word generally used is 'credibility. I suggest the communist NKVD has none. Instead of an actual excavated mass grave all we see is conjured text written by someone stating whatever was required by the NKVD. The examples of such communist examples are legion. I suggest looking at Nuremberg documents for proof of that. Your Kube silliness was indeed introduced at Nuremberg', PS-3428, as was well as NKVD 'proof' at Nuremberg that the Germans used steam chambers to kill Jews. According to you then, the lobstering of Jews was fact. BTW, examples of communist nonsense at Nuremberg are in abundance at this forum and elsewhere. Again, please show us the excavation and contents of the necessary mass grave for the alleged '10,000 Jews', not bogus communist nonsense. This utter lack of a necessary mass grave renders any attempt at doubling down with a claim that Kube says '6,000 were left alive' useless. It further exposes the fraudulent nature of the Nuremberg 'documents' in question. IOW, the communists can conjure 'documents', said to be of German origin, stating that the sky is bright green, even if there is no bright green sky to be seen. Imagine the reaction in a legit court of law where a claim of murder by shooting of 10,000 people in a specific location is made and a request to see the claimed human remains is met with 'Trust me, here is what I wrote'. Laughter galore. Let's not forget that there are thousands upon thousands of 'documents' attesting to the 'truth' of witchcraft & sorcery. No mass graves no mass murders. "We're talking about an alleged '6M Jews & 5M others' ... 11,000,000. There is not a single verifiable excavated enormous mass grave with contents actually SHOWN, not just claimed, (recall the claim of 900,000 buried at Treblinka, or 250,000 at Sobibor) even though Jews claim they still exist and claim to know exactly where these alleged enormous mass graves are." I thought the word 'liquidated' also was meant to mean expelled, removed, dispersed, sent east etc. People try to make words that were translated into English to have meaning that they don't perhaps mean. It's the old 'ausrotten' argument. So before TB&S opened "deported to the East" meant deported to the East, but after that it became code for "gassed"? Re your later post, I can't comment on the authenticity of the documents but I did struggle through the one in German and I could not find any reference to a gas van. In any case, as Borjastick has commented, the idea that a special team would be flown in ("gas van" also flown in??) when the men concerned could have simply been shot is rather far-fetched. Good to see you back, though. I expect you'll present reasonable arguments, whichever side they support. Keep an open mind. Kingfisher wrote: So before TB&S opened "deported to the East" meant deported to the East, but after that it became code for "gassed"? Considering how I shown that your supposed survivor of the AR camps was nothing of the sort, and you ducked even acknowledging that, this new *question* come across as pure disingenuousness. But if you want to provide some actual examples of "deported to the east" being used, we can discuss what was meant by it depending on when and by whom it was used. Re your later post, I can't comment on the authenticity of the documents but I did struggle through the one in German and I could not find any reference to a gas van. None of the three decodes mention a "gaswagon", but "Sonderkdo[s] LANGE" is mentioned. Anyone with a basic knowledge of this subject should know what "Sonderkommando Lange" was, or *allegedly* was. In any case, as Borjastick has commented, the idea that a special team would be flown in ("gas van" also flown in??) when the men concerned could have simply been shot is rather far-fetched. This was the Wehrmacht asking for the hospital patients to be *cleared* by a specific SS unit. Obviously the Wehrmacht didn't want to order regular German troops to drag sick people from their beds and shoot them. The Rabbit's last reply was nothing short of hilarious. The Rabbit's bizarre belief in laughable 'gas vans' is wondrous considering he has no proof and can't even show us one. I also see The Rabbit wisely punting to 'Hans' on the laughable & "gas vans". If someone with Hans' knowledge on gas vans had the chance to look through the decodes, they might be able to spot some that can be shown to be about gas vans by using other evidence, i.e. German documents. 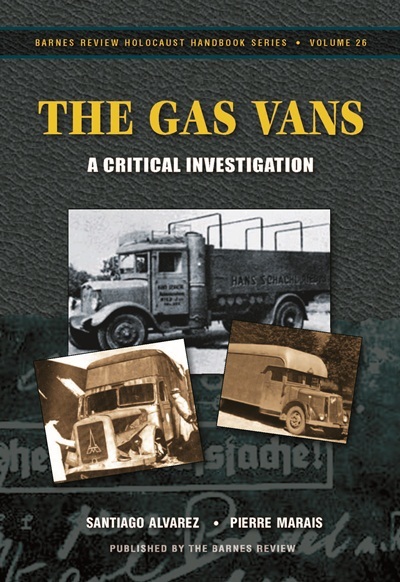 - phoney gas vans / J. McCarthy & 'holocaust' Hist. Proj. NEWS! magazine & Wiesenthal Ctr. caught faking 'gas vans'! Remember, The Rabbit is someone who religiously beliefs in ridiculous & impossible 'Nazi gas chambers', even though he dodges telling how us how they allegedly worked or showing us the massive human remains that necessarily would be available. 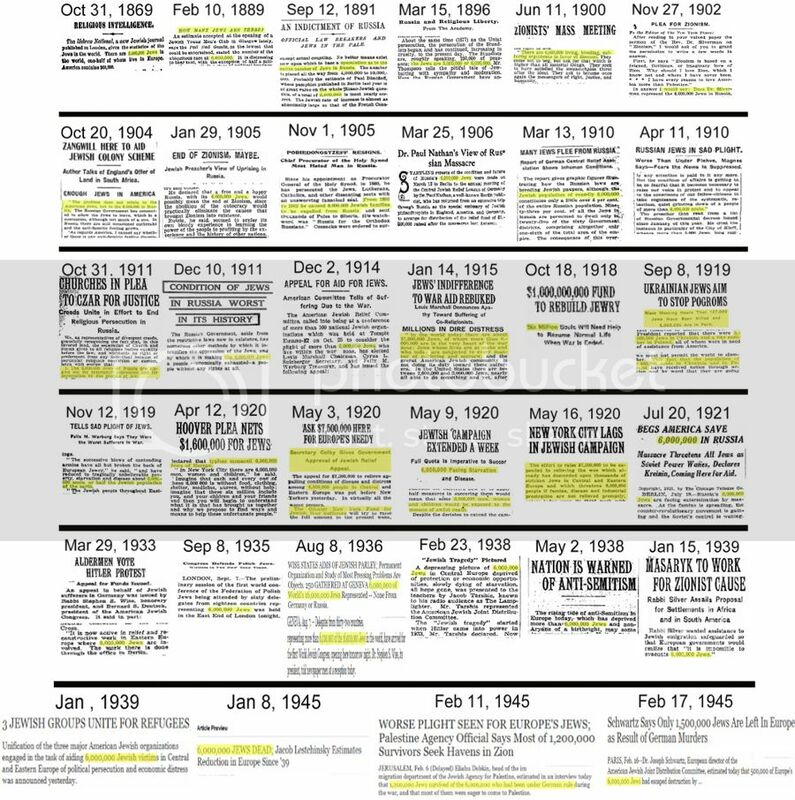 Why have supremacist Jews have been marketing the '6,000,000' lie since at least 1869? I never suggested he was a "survivor of the AR camps". And I don't rule anything out or in on the Eastern front, which saw some of the most brutal action in that most brutal of wars. I'm interested in evidence. I have no problem with suspending judgement or forming provisional views. I have no idea whether your document is genuine, but if it is, murder of some prisoners doth not a Holocaust make. The survival and return of Manfred Alexander is no more evidence that the Jews removed from Germany were resettled in the east, than a body buried at Sobibor is evidence it was a death camp. To evidence mass survival and resettlement requires evidence of where the millions of Jews removed from their homes by the Nazis ended up. Denialism has not been able to evidence where those people ended up. For example, denialism expects the Dutch people to believe that out of the 140,000 plus Dutch Jews registered by the Nazis in 1941, 107,000 Dutch Jews were transported somewhere else and never made contact again. That situation is repeated all over Nazi occupied countries. It is hardly surprising that a few Dutch Jews did make it back as there were escapes and survival as with Manfred Alexander. Kingfisher, why not study what those survivors have to say about what happened to them? Maybe you find evidence to back up your belief most of those deported to Sobibor survived. 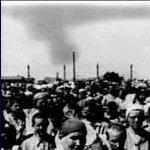 One body found at Sobibor actually does prove that it wasn't a death camp. But I digress from the point. Nessie displays all the selective memory of the holocaust believer/promoter in that he totally ignores the facts of eastern europe and Russia after the war and indeed up to the late 80s. I was born in South east London and worked in central London most of my working life. I don't think I ever met a Russian, Pole, East German etc and if I did they would have been of working age in the commercial world. So how on earth does he expect jews sent east by both Germany and Russia to have made it back across a totally changed landscape, together with a Cold War, Berlin Wall, total restrictions on personal travel and monetary controls too? Jews are famous for being detached from their host countries. In other words jew first then nationality of birth second. My guess is that many jews who were sent east made the best of their new found circumstances, counted their lucky stars that they hadn't been sent to a 'death camp' as they had been educated to believe and enjoyed what life dished out for them, good or bad. We all know of rich and famous jews in British politics and business such as Miliband and Robert Maxwell etc who claimed that all their close family members had been eliminated in the holocaust, thus they didn't spend time wandering around the now open borders of eastern europe searching for them after 1989. It comes as no surprise to me that hundreds of thousands of jews sent east never surfaced again. What's true is that while we cannot exactly locate and verify their history post war, neither can Nessie except to claim they were all gassed and disappeared up a chimney or into pits. The remains of these people of course can never be shown.